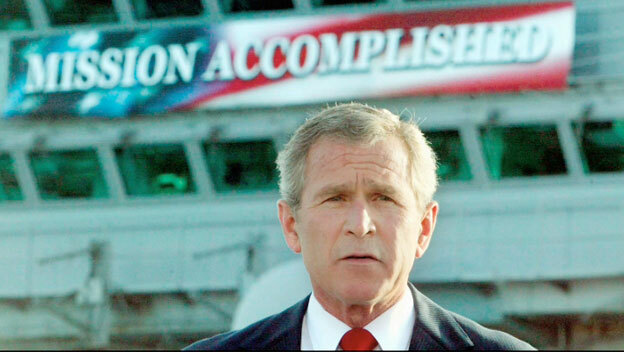 Let's think for a moment about how strangely the invasion of Iraq blew back on America. If I were to pick the genesis of Donald Trump’s presidency, however, I think I would choose an even earlier moment ― at a Pentagon partially in ruins thanks to hijacked American Airlines flight 77. There, only five hours after the attack, Secretary of Defense Donald Rumsfeld, already aware that the destruction around him was probably Osama bin Laden’s responsibility, ordered his aides (according to notes one of them took) to begin planning for a retaliatory strike against... yes, Saddam Hussein’s Iraq. His exact words: “Go massive. Sweep it all up. Things related and not.” And swept almost instantly into the giant dustbin of what would become the Global War on Terror (or GWOT), as ordered, would be something completely unrelated to 9/11 (not that the Bush administration ever admitted that). It was, however, intimately related to the deepest dreams of the men (and woman) who oversaw foreign policy in the Bush years: the elimination of Iraq’s autocratic ruler, Saddam Hussein. It would instead be an act of imperial loneliness befitting the last superpower on planet Earth. The Iraqis would, of course, greet us as liberators and we would set up a long-term garrison state in the oil heartlands of the Middle East. At the moment the invasion was launched, in fact, the Pentagon already had plans on the drawing boards for the building of four permanent U.S. mega-bases (initially endearingly labeled “enduring camps”) in Iraq on which thousands of U.S. troops could hunker down for an eternity. At the peak of the occupation, there would be more than 500 bases, ranging from tiny combat outposts to ones the size of small American towns ― many transformed after 2011 into the ghost towns of a dream gone mad until a few were recently reoccupied by U.S. troops in the battle against the Islamic State. In the end, a victory-less permanent war across the Greater Middle East did indeed come home. In the wake of the friendly occupation of now-democratic (and grateful) Iraq, the hostile Syria of the al-Assad family would naturally be between a hammer and an anvil (American-garrisoned Iraq and Israel), while the fundamentalist Iranian regime, after more than two decades of implacable anti-American hostility, would be done for. The neocon quip of that moment was: “Everyone wants to go to Baghdad. Real men want to go to Tehran.” Soon enough ― it was inevitable ― Washington would dominate the Greater Middle East from Pakistan to North Africa in a way no great power ever had. It would be the beginning of a Pax Americana moment on planet Earth that would stretch on for generations to come. This is evidently what “America First” actually means: a country walled off and walled in. Trump Criticizes The War In Iraq But Does He Want To Repeat It?